one side 30″ or longer. both sides 20″ or longer. Ships in 12 business days. Custom sizes cannot be returned. For the most cost-effective solution, first see if our standard sizes will meet your needs. Without proper filtration, dust can clog air conditioning systems and grease particles can cause fires in oven vents. 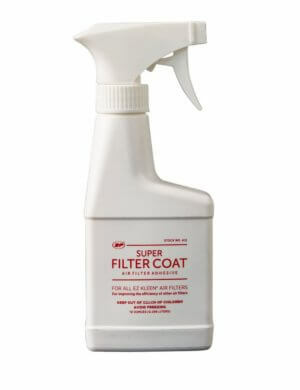 Keep 98% of grease and other contaminants out of your HVAC systems with Research Products EZ Kleen mesh air filters. Our custom-sized EZ Kleen mesh filters come in heights and widths from 1.75″ to 60″, and you can wash and reuse them to lower costs. Made of strong, lightweight aluminum, these filters are immune to rust and resist wear and corrosion. They also attenuate electromagnetic and radio frequency interference (EMI/RFI). Maximum continuous operating temperature is 240°F, minimum area for a custom filter is 25 in2. Contact us for filters over 599 in2 in area. 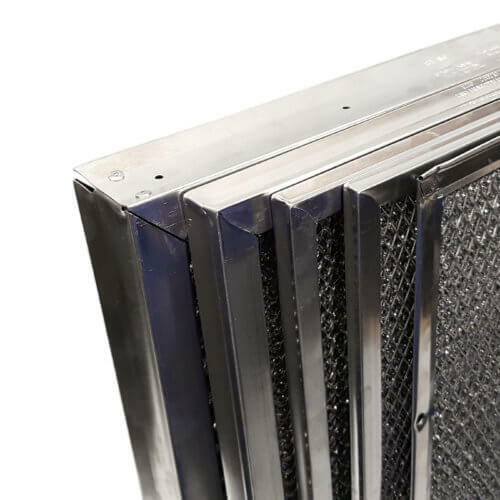 Use our UL certified EZ Kleen mesh filters in range hoods, exhaust fans, air handlers and other residential, commercial, school, and industrial HVAC applications. 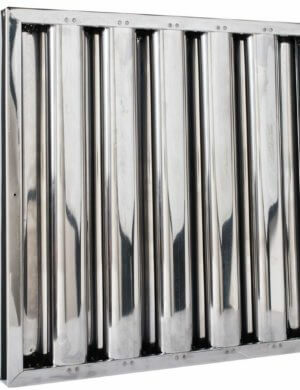 EZ Kleen aluminum mesh filters are manufactured as depth filters, with multiple layers of aluminum material slit and expanded through specific feeds to ensure maximum filtering. 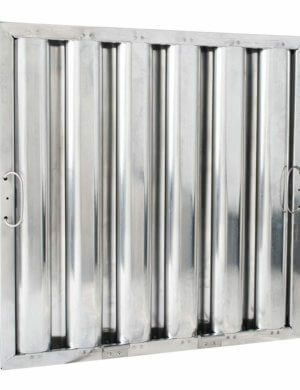 A mitered aluminum frame encloses the media, secured at one corner by rivets or a metal overlap enclosure. Custom frames are manufactured to your specified exact height and width, with a tolerance of ± 1/16″. See the table below for exact thickness dimensions. 2" thickness 1 7/8" +0"/-1/16"
1" thickness 7/8" ± 1/32"
1/2" thickness 15/32" ± 1/32"
3/8" thickness 11/32" ± 1/32"